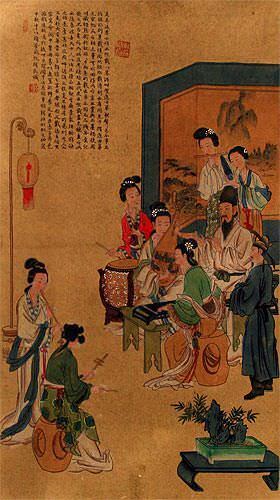 Artwork Panel: 50.5cm x 89cm ≈ 19¾" x 35"
Silk/Brocade: 58.9cm x 145cm ≈ 23¼" x 57"
Width at Wooden Knobs: 67.9cm ≈ 26¾"
This wall scroll features seven female musicians creating music for their master in ancient China. However, the Chinese title written on this work means "Evening Feast Painting". It should be noted that this is a "partial print". The black detailed lines were printed on the special handmade paper. We don't do a lot of partial prints like this, but many people kept requesting antique-styled wall scrolls. I finally picked some up on my last trip. The use of the printing process for this artwork keeps the price of the artwork affordable (it would be more than 3 times more if this was 100% hand-painted). All of the colored portions are hand-painted.